This moist loaf cake is infused with the tropical flavour of coconut, it’s then topped with silky smooth coconut buttercream and drizzled with fresh passion fruit. This weekend saw another meet up of the Enfield Cake Lovers. We are a group of women who all live in North London who try to get together once a month for a slice of cake and a natter. Sadly when it came to baking my cake this time I was feeling completely uninspired. I don’t know whether its because I’ve been trying to up my fruit and veggie intake and passing on the sweet stuff but every idea I came up with just didn’t excite me. I put the call out on my Facebook page and Instagram to see what you guys might come up with. It was @theunlikely_foodie who came to the rescue and suggested I bake a Coconut and Passion Fruit Cake. The second I read it I knew I had to bake it. 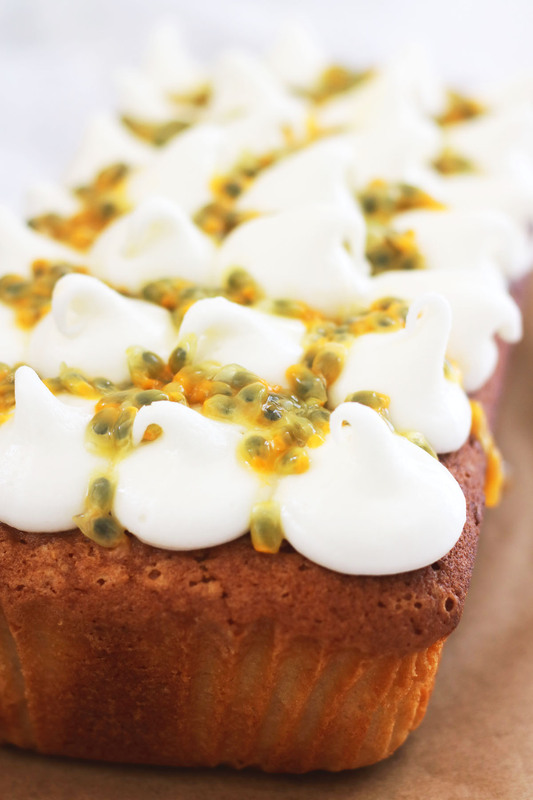 What was so special about a coconut and Passion Fruit Cake I hear you ask? Well, I’ll let you in on a secret. It just so happens to be one of the tiers of my wedding cake! Although we aren’t getting married for another 16 months we’ve already decided on the most important part – the wedding cake. We’ve gone for some slightly more traditional flavours in the other tiers but its the Coconut and Passion Fruit Cake that Jon and I are most excited about. Now I’ve got no idea what recipe our cake maker uses but I figured I’d have a go at coming up with my own. I had originally intended to do a layer cake but Friday evening rolled around and I still hadn’t baked my cake. If I was going to do a layer cake I’d need a good few hours to bake and decorate and I just didn’t have the energy. So, I opted for a loaf cake instead. I love loaf cakes as they are simple to make and even simpler to decorate. They can be a thing of beauty despite involving minimal effort. I also love how easy it is to cut a slice to be served alongside a cup of tea or mug of coffee. They really are ideal for cake club! I took my usual loaf recipe and thought about how I might infuse it with the flavours of coconut. With so many coconut products out there I wasn’t entirely sure where to begin. Should I replace butter with coconut oil, or what about coconut milk or coconut cream? Should I swap out some flour for desiccated coconut? I decided that I’d still use some butter but half a tin of coconut milk would also go into the batter to make the sponge moist and tender. I almost didn’t add in any desiccated coconut but changed my mind at the last minute. I’m really glad I did so don’t skip it out! Off course you can always add some on top too. I thought long and hard about how I might incorporate the passion fruit into the actual sponge itself but after a lot of reading online I decided that the flavour would be too overpowering and the texture wouldn’t have been quite right. What I love about this sponge cake is how delicate the crumb structure is. It’s quite dense but velvety and the sponge just melts in your mouth. The silky coconut buttercream enhance the coconut flavour of the sponge then the passion fruit drizzle follows up behind with a sweet and zesty kick. I absolutely adore passion fruits and will munch on 3 maybe even 4 for breakfast alongside some coconut yogurt. I knew that they’d work perfectly drizzled over the coconut loaf also bring a bit of colour to the cake! 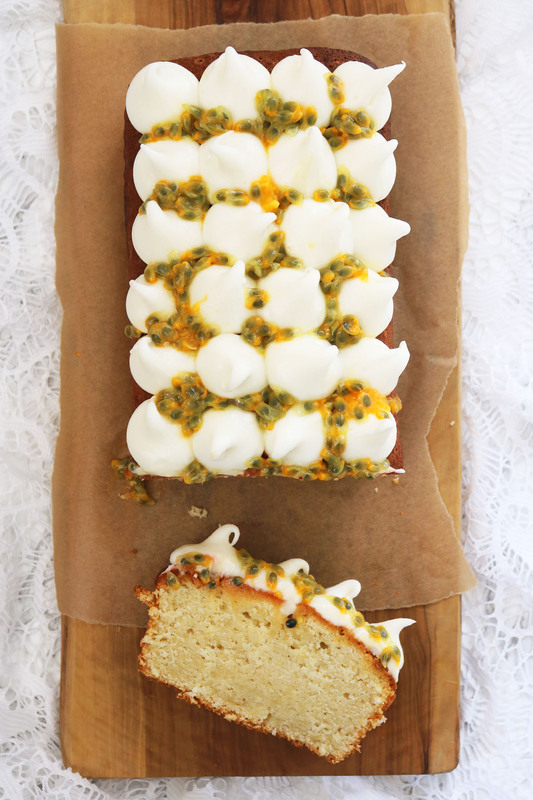 So fancy making a Coconut Loaf Cake with Passion Fruit Drizzle? You’ve come to the right place. 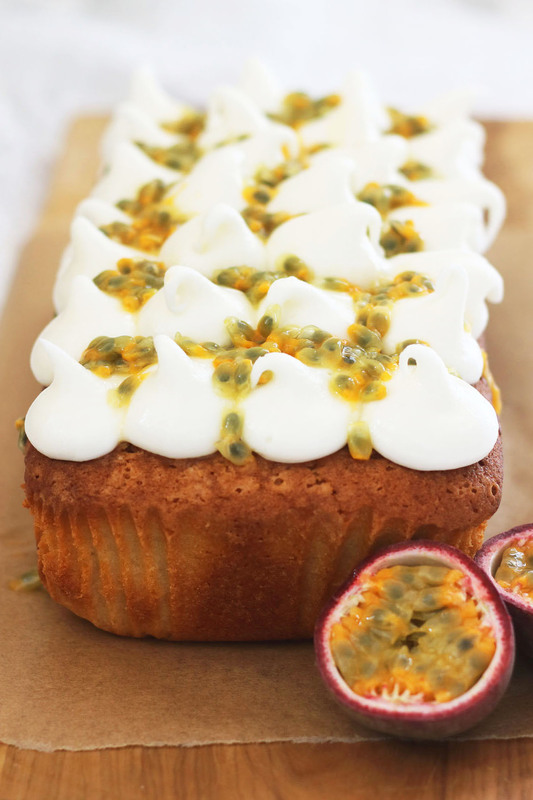 This Coconut and Passion Fruit Loaf Cake is a wonderful soft, moist sponge, topped with a light coconut buttercream and fresh passion fruit drizzle. Line a 2lb loaf tin with grease proof paper. (See note 2). In a large bowl, begin creaming together the butter and sugar with an electric whisk. Beat the butter and sugar well until smooth and creamy. Continue to beat the butter and sugar together adding one egg at a time. Beat the mix well in between the addition of each egg so that the mix is pale and fluffy. Add the coconut milk to the bowl and beat gently until fully combined. Sift the flour into the bowl and fold in gently. Finally fold in the desiccated coconut. Pour the cake mix into the lined tin and bake in the centre of your oven for 1 hour or until the cake is golden, springy to the touch and a skewer comes out of the centre clean. Transfer the loaf cake to a wire cooling rack and leave to cool completely before decorating. One the cake is completely cool, beat together the coconut milk and the butter until pale and creamy. Add in the icing sugar and beat well until you have a smooth icing that can be piped. Spoon the buttercream into an icing bag fitted with a large round nozzle. Hold the piping bag vertically and gently squeeze the buttercream onto the cake forming little peaks. Repeat until the top of the cake is covered. Cut the passion fruits in half and spoon out the pulp. Mix well to break up any clumps then drizzle over the cake. Sprinkle some desiccated coconut over the cake to finish. To get a pale, almost white buttercream I use Lurpak spreadable. It's a very pale yellow to begin with and gets lighter as you beat it with the coconut milk. Don't want to faff about lining your loaf tin? I don't blame you, neither do I! That's why I buy these loaf liners from Amazon. If you like this recipe then you’ll love these other loaf cake recipes. I buy those loaf tin liners too, they also work for meatloaf, I wouldn’t be without them. Love your fruity loaf cake, my mouth is watering just looking at the photograph. You have inspired me! I’m always scared of making layered cakes so tand to make loaves but I’ve never decorated them. Today will be that day! I shall pimp up my granny’s gingerbread.